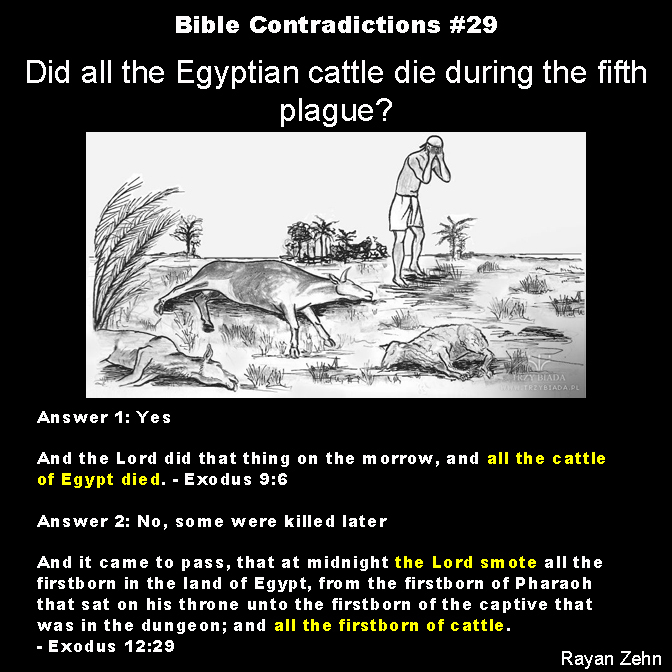 Bible Contradictions #29: Did all the Egyptian cattle die during the fifth plague? We all know the story. Moses wanted to take the Hebrews on a weekend getaway, but god forced the pharaoh to reject Moses’ request in order to try out his new toy: a set of plagues he just purchased from FAO Schwarz. If you want a refresher, here’s a quick rundown of the plagues in order. One of the moral problems with this story is the fate of thousands of innocent bystanders. I’m not just talking about the deaths of innocent babies caught in god’s crossfire (although that is an unforgivable crime); I’m also talking about the fate of all the cattle of Egypt. Did they all die? The bible — once again — is not that clear. During the fifth plague god killed all the cattle of Egypt. That is, not one cattle survived. His abilities to kill every cattle in sight is more efficient than any modern day slaughter house. During the final plague, however, god kills all the firstborn of Egypt, including innocent human babies and innocent calfs, even though there were none to be found, according to the earlier plague. This is quite a remarkable contradiction. I’m quite surprised it made it by the copy editors. I haven’t heard any attempts to explain this contradiction, but I can venture a guess of how someone might attempt to explain it. Because these plagues, particularly the fifth plague, was aimed only at the Egyptians and not the Israelites, then could it be that the Egyptians merely stole all the Hebrews’ cows after theirs were wiped out? Sure. Of course it is. But that’s not in the bible. Indeed, if that was in the bible, it would give Moses more credibility. Early Jewish scribes would have definitely used that to further highlight their persecution. Nope. This is precisely what happens when people go around just making up stories. They forget about the details and later contradict themselves. This entry was posted in Atheism, Bible Contradictions and tagged Atheism, Bible Contradictions, Christianity, Christians, contradictions in the bible, Egypt, God, God of Abraham, Judaism, Moses, Religion, the bible. Bookmark the permalink. 9 Responses to Bible Contradictions #29: Did all the Egyptian cattle die during the fifth plague? The reason is you are comparing two different plagues. Um… that was kind of the entire premise of this post. Were they all killed during the 5th plague? Or were some saved to be killed during the final plague? I can’t compare one plague against itself. Sometimes I think you criticize just to criticize, without actually reading my posts. The Israelites were their slaves, so they simply took their cattle of them. Suppose all the cattle were killed in the 1st plague. Do you suppose Pharaoh would just stand there with his nickers down around his angles? Cattle and other items were constantly being brought into Egypt through trade and the usual extortion and pillaging committed by an ancient super power. Conveniently adding things to the bible does not fix a contradiction. I can add things to the bible too. Besides, we all (as in people who study history) know that the Moses story never actually happened. Mr Zehn, it would seem that all Silence has ever had is argumentations of obvious lies to back the stories he tells. He will always be known as he who lies for Jesus. Unfortunately, SOM actually believes these lies. I’ve never heard him/her tell me that a certain story in the bible never happened — that it’s a parable. Instead SOM merely attempts to justify it. You are correct that som’s trying to justify his own claims through that of lying, but does he believe his own hypocritical nonsensical drivil? I’m not convinced of that entirely. I think that his demeanor stems more from desperation,than anything else. As his blog shows the utter hatred he has for atheists. But the one thing that will never ascape him, is the very fact that when lying to others will never will grant him/her nothing. As that will always be the testament of ones own caricature, which will grant the individual nothing in life. As som’s own words will be meaningless. No different than the boy who cried wolf. Mr Zehn, I hope you can please excuse the selling of my previous post? I was very stoned at the time, and couldn’t even see very straight. Sometimes we all have to unwind. Ha!